You need to know what the best pet life jacket is for your little (or not so little) buddy so they can stay safe while ya’ll play in the water. Seems like it ought to be pretty simple but once you go looking and find all the different shapes, styles and brands of pet life vests all claiming to be “the best”....turns out it’s kinda confusing. In a hurry? 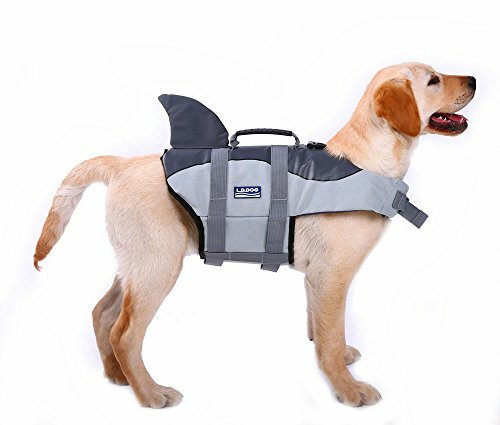 Here’s the Current Top Rated pet life jackets on Amazon! That’s why with summer just around the corner we decided to do a deep dive into the realm of pet life jackets and ferret out the truth about them so you don’t have to. The critical intel you need to know won’t change no matter if you are looking for a dog life jacket, a cat life jacket or even a bunny life jacket. 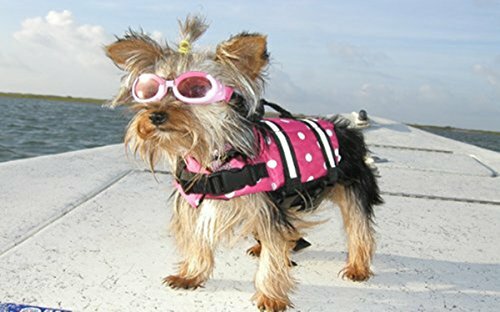 So, kick back with a cuppa and let us share with you the need to know scoop on life jackets for pets. 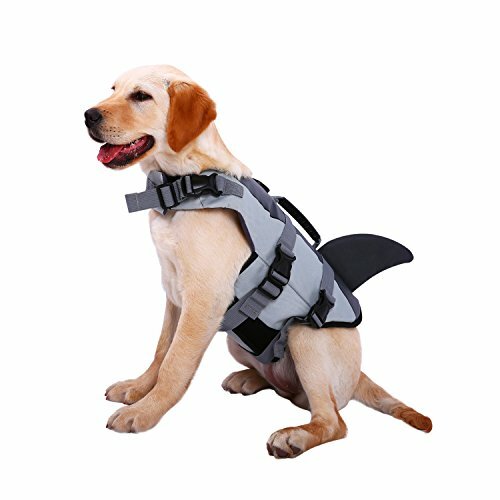 Why get a pet life jacket for your special buddy? Aren’t Pet Life Jackets Just For Folks With Boats? How to measure your pet for a pet life jacket? It’s a misconception that all animals (especially dogs) are great swimmers from birth. While it is true that an animal who falls into water will instinctively start to “doggy paddle” this doesn’t mean they will be good at it or be able to keep it up for long. Don’t forget that even great swimmers can drown if they find themselves in rough water, if they tire or become tangled in something like seaweed. Why take the chance with your best friends life? 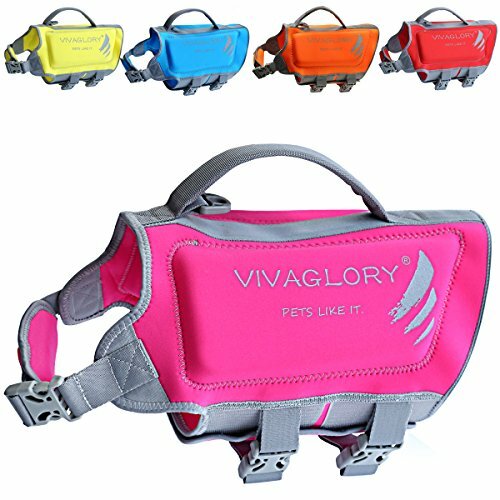 Vivaglory Dog Life Jacket Adjustable Dog Lifesaver Safety Reflective Vest Pet Life Preserver.. See why it has 4.5 stars & over 500 reviews here! Absolutely Not! Did you know that thousands of dogs drown in backyard pools each year? Though you will for sure want you have a life vest for your pet if you plan to take them out on your boat with you. You’ll still want to keep your pet friends safe when kayaking, paddle boarding or just playing fetch in the lake. Won’t you? Buoyancy... This is how much weight it can float. Be sure to get one that will easily float your pets current weight. Size, Fit & Customization... Doesn’t matter if you need an xxs dog life jacket or an xxl dog life jacket it has to fit right or it’s useless. 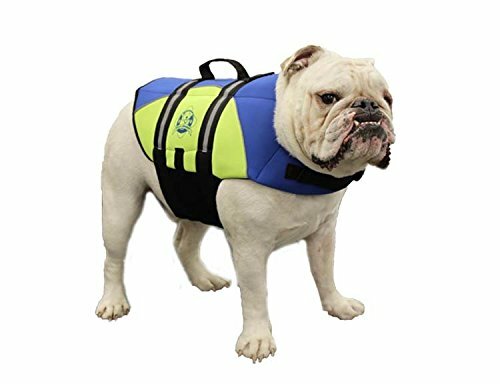 Be sure to measure your pet before buying a life vest for them (see below) and make sure you get one that can be adjusted for a perfect fit. Sturdy Handles... In addition to being a flotation device your pets life jacket should provide easy to grab handles so you can haul your pet out of the water and back into your boat if they fall overboard or after they are done swimming with you. Bright Color... Aside from being a fashion statement a brightly colored pet life jacket makes it easy to spot them in a crisis situation. Durability... This seems like a “no-brainer” but it is essential so we include it. 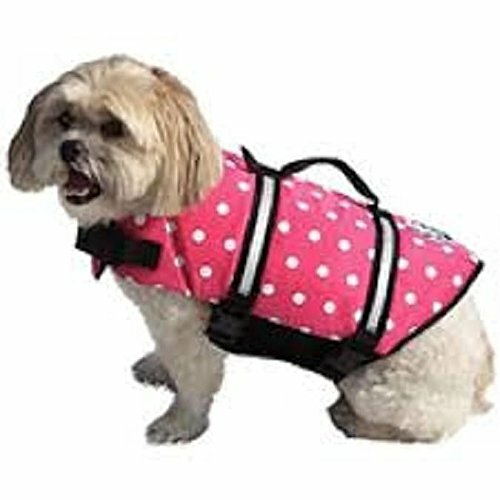 Be sure the pet life jacket you get will stand up well to lots of wet fun in the sun. This is one reason many folks opt for a neoprene dog life jacket. Girth... You measure this AROUND YOUR PETS CHEST. Be sure to measure the widest point. In most pets this is right behind their front legs but may be slightly farther back in some dog breeds. Length... This is the distance from the base of your pets neck down the length of her back. Stop measuring about 3 inches before the tail begins. Weight... Just because it fits doesn’t necessarily mean it can float your pet. So be sure you get a pet life jacket that can handle the weight of your pet. Pro Tip: When your pet is between sizes buy the larger size and use the adjusting straps to cinch it down to fit your pet. That way there’ll be no chafing and they won’t be restricted either in or out of the water. Having trouble deciding which life jacket to get for your precious fur baby? 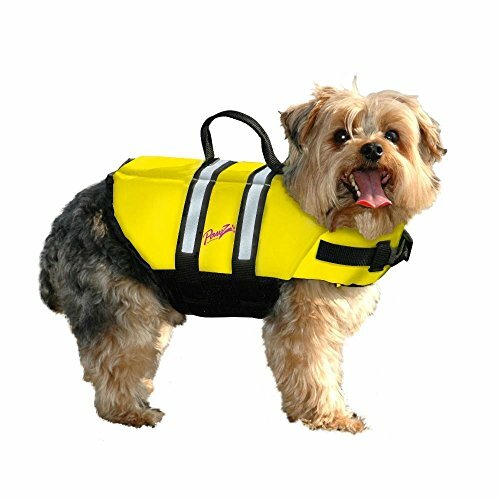 We get it, there is no shortage of really great pet life vests for you to choose from. Which is a really good thing but it can be overwhelming too. So, we've put together the following list of pet flotation devices we like best. 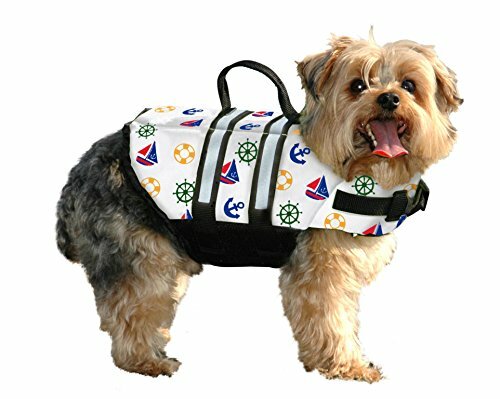 The Paws Aboard Life Jacket is a brightly colored neoprene pet jacket has really wide velcro closures under the tummy. For added security they are covered with quick release buckling straps. Reflective trim helps you spot your pet and heavy duty handles on top make for quick easy grabbing when needed. 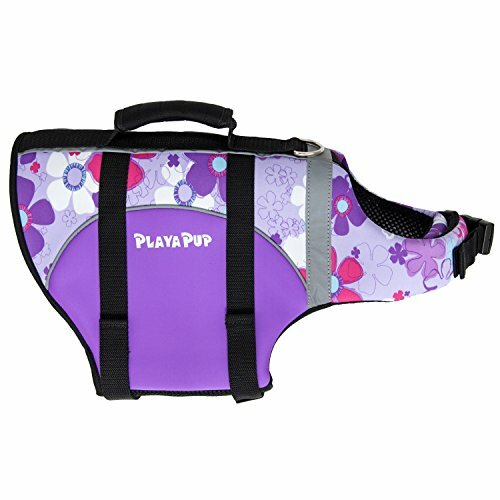 The Outward Hound life jacket and vests are made of rip-stop material that comes in what they call “can’t miss colors”. They are very bright orange, pink and one even is stripped to look like “Nemo”. They don’t restrict your dogs motion out of water and have a neoprene belly strap for durability and comfort. We love the size chart and fitting information they provide on Amazon and the fact that there are two handles for you to hoist your pet out of the water if need be. 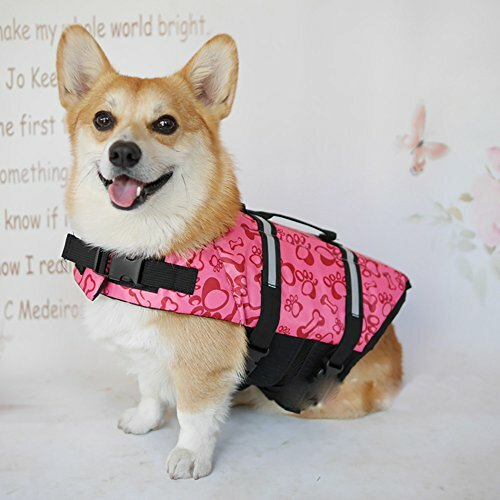 These pet life jackets come in blue, yellow, pink, red and orange. All of them have reflective strips, an extra sturdy handle and a leash clip. 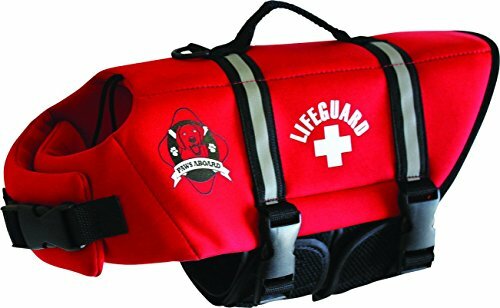 They cost a bit more than the other pet life vests here but we think they are worth it for a lot of folks because all the straps are covered or inside the tough outer fabric of the jacket. This keeps them from being clogged with sand or being accidentally opened by your pet as he plays. Check out this very stylish Ruffwear Life Jacket here! The new kid on the block, Ezydog doggy flotation device is designed for rugged use and extra flotation. They have all the features you would expect them to have, bright colors, neoprene straps, reflective strips and ergonomic handles. In addition they have up to 50% more flotation material with less bulk and are made from extra durable materials for the most active of pets and their owners. Adventure pets everywhere love these life jackets. Ok, this Kurgo Surf N Turf dog life jacket is a twofer! It’s a pet life vest and a raincoat in one! Yup, the flotation layer can be easily removed so it can be worn as any other dog apparel to keep your pet warm on cool spring or fall days or keep them dry when it’s raining. It is brightly colored, has reflective strips and has two metal D rings for connecting leashes. The transverse handles (meaning one is parallel to your dog's spine and one crosses it) make it super easy to maneuver your pet if you need to. Oh, and did we mention it comes with a Lifetime Guarantee? So now you know why you need a life vest for your pet, what to look for when buying one and how to measure your pet to get the right fit. And now that you’ve seen the best pet life jackets on the market for 2018 we know you’re little buddies will be safe while they romp in the water with you this year. 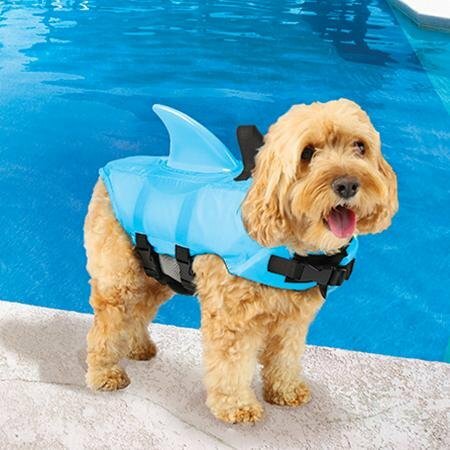 Like These Pet Life Jacket Ideas? Please Share With Your Friends. Thank YOU!